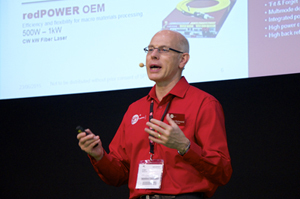 In our latest whitepaper, Dr. Mark Richmond (Product Manager, CW Lasers) explains how our portfolio of CW Lasers can enhancing our customers cutting productivity via the effective use of the inbuilt piercing software. To download the full article as a PDF click here! 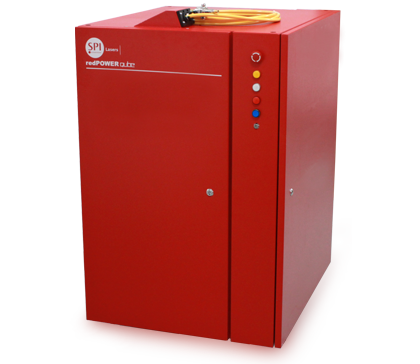 Fiber lasers have become more accepted for industrial laser applications all around the world. Global sales of all lasers for metal cutting are over $1.1 billion and growing at 3–4% per year, as they are being incorporated into an estimated 7000 sheet metal cutting machines installed in 2017. Fiber lasers have been steadily replacing carbon-dioxide (CO2) lasers in this market sector due to advantages that include higher efficiency, high beam quality, and the ability to process highly reflective material such as copper and copper alloys. Therefore, fiber laser sales in this sector now exceed that of CO2 lasers. Performance improvements for this application will have significant impact on global economies, as there is growing dependence on fabricated metal goods. Newer generations of fiber lasers are now beginning to incorporate additional sensors and diagnostics that allow more advanced functions to be performed: an example being the 6kW redPOWER QUBE fiber laser, designed to avoid damage and poor performance caused by back-reflections using a patented angle capillary tube within the PIPA-Q delivery fiber, controlled removal of back-reflected light within the laser and by incorporating photodiodes to monitor and protect the system. 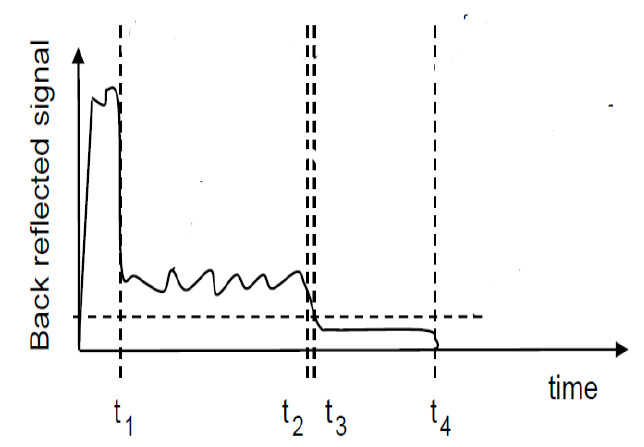 (FIGURE 1). Industrial laser cutting systems generally pierce and cut using separate operations, with fixed parameter sets for each given material and thickness. The piercing procedure is often programmed for a fixed dwell time, which can result in a loss of machine efficiency and pierce quality—particularly for thick samples with many holes. However, it is possible to improve these processes by sensing the light returning from the workpiece to the laser in real time. This back-reflected (BR) light is usually considered a nuisance, but it contains information about the cutting process and can be used to detect the end of the pierce phase. Figure 1: The multi-kW redPOWER QUBE Fiber Laser is harnessing back reflected light to provide integrated Pierce Detection feature. Pierce detection systems already exist that are based within the cutting workstation. 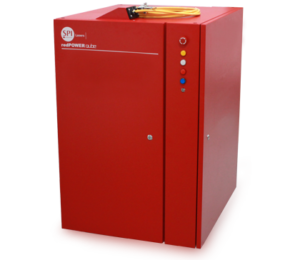 However, next-generation fiber lasers, such as the redPOWER QUBE lasers, have an integrated pierce-detection system that removes the need for any costly additional sensors within the cutting head. Many types of pierce detection systems exist that provide feedback to the cutting machine controller as soon as a pierce breakthrough is achieved. This allows the controller to move onto the cutting phase with the minimum necessary dwell time. Usually, pierce detection systems are based within the cutting workstation around the focusing head, but this results in a more complex and costly cutting head and an optical system with additional optical surfaces that can degrade the laser beam. They are also susceptible to damage because of the dusty environment often experienced when working near the cutting process. For a skeleton cutting job on a 3 × 2m sheet, 2500 pierces may be needed, so time saving of 100ms/pierce reduces the process time for each sheet by over 4min. Modeling across a range of materials and thicknesses has demonstrated typical 10–15% time savings using a pierce detection system, so the economics of investing in automated pierce detection are clear and considered necessary for all high-performance cutting systems. A laser cutting process is structured in several different phases. Piercing is the first phase, which produces a near-vertical cut front through the sheet metal, forming the start point of every cut. Depending on material and sheet thickness, a complex pulse shape and power ramp may be necessary to achieve short pierce times, as well as reduce spatter and bulging on the workpiece surface. And, according to temperature, surface roughness, and material quality of the workpiece, pierce times can vary widely for the same pierce program. For industrial processes, a certain safety factor (typically up to 3X) is added to the average dwell time, which is obviously not necessary for most pierces, but vital to ensure a stable process for every pierce. A sheet metal pierce with a fiber laser and gas-assisted cutting head is similar to a laser hole-drilling process. Initially, the focused beam will be absorbed by the top surface of the sheet, causing a localized temperature increase that leads to melting and potentially vaporization, depending on the beam intensity. The coaxial gas jet pressure and the vapor pressure of the evaporating metal will create a blind hole with molten metal droplets sprayed upwards and outwards. The drilling process continues as the laser beam goes through the full sheet thickness. While the pierce-hole is blind (that is, not yet fully drilled through the sheet thickness), there will be an increased level of laser light reflected upwards since all of the beam will impinge on the metal sheet. This is in contrast to the steady-state cutting process, where the angled cut front will enable most of the unused portion of the beam to emerge from the backside of the sheet. From the beginning of the pierce to t1, there is a large BR signal. This is consistent with the laser hitting the blank surface and breaking down the initial reflectivity. From t1 to t2, the pierce is a blind hole as the laser drills through the sheet thickness. The BR is unstable as the shape and position of the melt-pool changes, but at higher levels compared to steady-state cutting. From t2 to t3, there is a transition as the pierce breaks through the back side of the sheet. After t3, there are relatively low (but non-zero) levels of BR until the laser is switched off at t4. Figure 2: Typical back reflections observed during the piercing process. 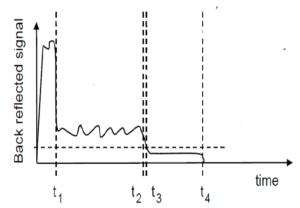 FIGURE 3 shows an actual BR signal trace from a piercing cycle (with the detector initially in saturation). This was obtained using a 1.5kW laser with a 50μm delivery fiber (beam parameter product = 2.0) processing a 6mm stainless steel plate with a ~100μm focal spot, with the beam waist positioned below the workpiece surface. In this experiment, a supplementary detector was placed underneath the workpiece to confirm pierce-through. The digital Pierce Flag can be clearly seen to go HIGH as the supplementary detector goes into saturation, indicating full pierce-through. Importantly, there is an automatic reset of the Pierce Flag at the end of the laser ON period. Figure 3: Back reflections from piercing during a complete laser pulse (a) and a piercing period only (b) are shown. The pierce detection system operates by identifying the point where t3 has been reached. This activates a programmable delay time, which is important to ensure that the pierce process has finished. Once the BR signal is below the threshold for the duration of the delay time, the pierce is considered finished and the laser provides a digital Pierce Flag signal that can be integrated into the production machine. The thresholds and dwell times are programmable, so the user can adjust the settings to ensure that the Pierce Flag behavior is optimized for their process, with the Pierce Flag going High just as the pierce through is completed. In many operations, the pierce is achieved using a pulsing mode of operation for the laser to give a cleaner and more controlled pierce hole. 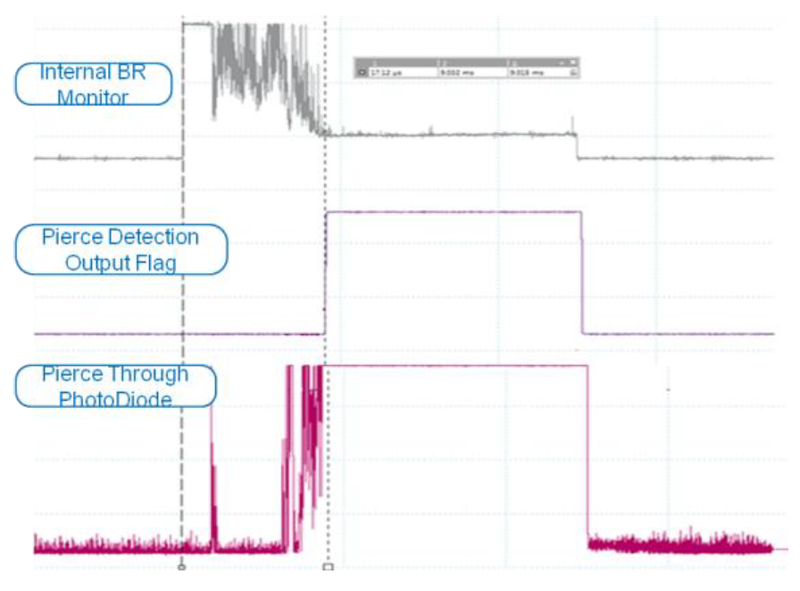 By choosing suitable parameters for the detection algorithm, the pierce detection flag will still trigger at the appropriate point. Pierce detection systems are becoming a required component of modern flatbed cutting workstations to ensure high performance and efficiency. For example, with the pierce detection sensors integrated in the redPOWER laser, the customer can decide to use a more cost-efficient cutting head rather than an expensive product. 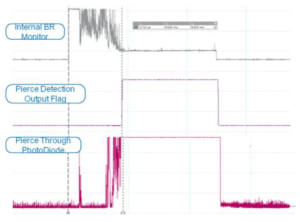 Being able to monitor the amount of BR from the cutting process is a huge advantage, for both setting up the correct process parameters and for in-process quality monitoring. Piercing and cutting operations can be examined and optimized, and high levels of BR from highly reflective sheet materials can be avoided. Ultimately, the productivity of a laser cutting system can be increased by using a pierce detection system to ensure high machine efficiency and reduced time loss during piercing. Simulations have shown that process time can be shortened by up to 15% on a 3 × 1.5m sheet with realistic part layout. Depending on the part complexity and size, actual time and cost savings could be even higher. Dr. MARK RICHMOND (mark.richmond@spilasers.com) is product manager – CW Lasers at SPI Lasers, Rugby, Warwickshire, England; www.spilasers.com. To be kept informed about our latest Fiber Laser developments, white papers, webinars and much more, register your interest HERE and we will make sure you receive information on your chosen subjects as soon as it’s available. And to see more of our whitepapers across Welding, Additive Manufacturing, Colour Marking and many more, click here!